Plus: Catfish > tilapia. Here’s where to find it. There is nothing I hate more than hovering servers. Constant napkin refolding, water topping, and queries about my well-being drive me nuts. But I don’t want to be completely ignored either. (See? I’m tricky.) 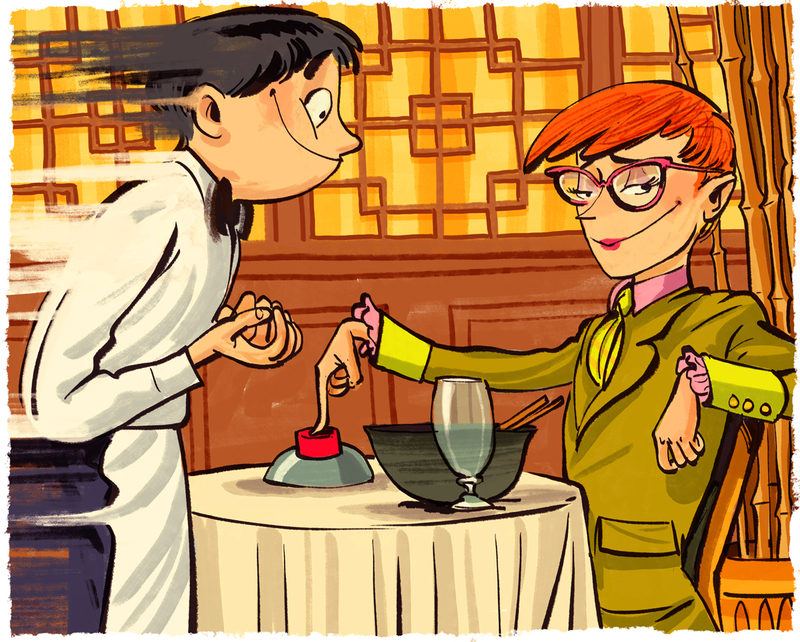 Trying to catch a server’s eye in a mobbed restaurant is an exercise in futility. One easy way to negotiate the right level of service is the buzzer common in Korean restaurants both high (Breakers in Duluth) and low (Thank U Chicken, also in Duluth). Picture a red button mounted next to your table. Push it, and a server materializes, ready to turn down the flame below your sizzling meat, refill your kimchi bowl, or bring you more barley tea. These buzzers have been popular in Korea since the late 1990s as a way to make service more efficient. HB Cho, a reporter for U.S.–based newspaper The Korea Daily, thinks that “having to hear chimes go off in the kitchen can be distracting” and prefers the Secret Service–style earpieces that waiters in some Korean restaurants have started wearing. Either way, for me, the ability to summon another human being effortlessly, just like the button above your seat in an airplane, feels like true luxury. I think of tilapia as an interloper. No one had heard of the fish before the start of the millennium, and yet, it has all but supplanted native catfish, once a mainstay of the Southern table. Yes, tilapia is deemed a “best choice” and “good alternative” for healthy oceans by the Monterey Bay Aquarium Seafood Watch, but with the exception of imports from China and Vietnam, so is catfish. And domestic catfish, whether wild or farm-raised, has a clean yet robust flavor. Tilapia has an unpleasant, faintly chemical aftertaste. There are a few Atlanta chefs who seek out catfish. Travis Carroll of Dish Dive looks for fishermen who catch them in Lake Oconee. Eat Me Speak Me’s Jarrett Stieber sources from St. Simons Island. 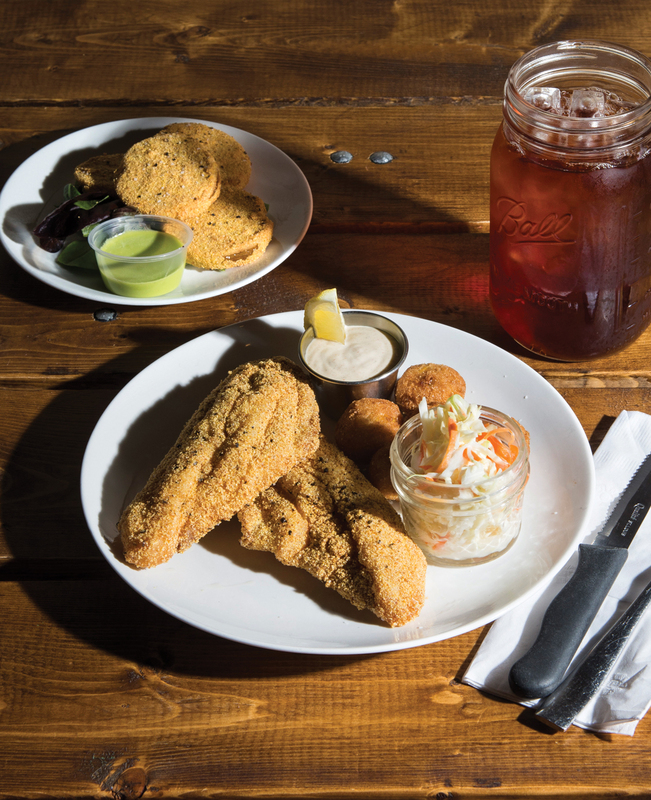 Billy Allin of Cakes & Ale recommends Carolina Classics, whose catfish are raised without antibiotics in ponds filled with well- and rainwater. But these chefs only rarely serve catfish. Catfish Hox, on the other hand, is a country-in-the-city, mom-and-pop restaurant that opened in an East Cobb strip mall in 2016 and serves catfish daily. Owners Phil and Vivian Creasor source from Mississippi’s Heartland Catfish, which operates a state-of-the-art facility with its own processing plant. Order a platter of their sublimely light and crisp catfish fillets—they’re dusted with cornmeal, gently fried. It’s a trip back to a simpler time. This article appears in our March 2018 issue.